All my adult life I’ve wanted a room with a beautiful fireplace but so far I’ve never owned a house with a functional fireplace. My parents’ house had a gorgeous stone fireplace that stretched up one wall of the vaulted living room. It was pretty impressive and is probably the reason for my desire to have one. For now, I have a faux mantel that’s pretty enough for me. 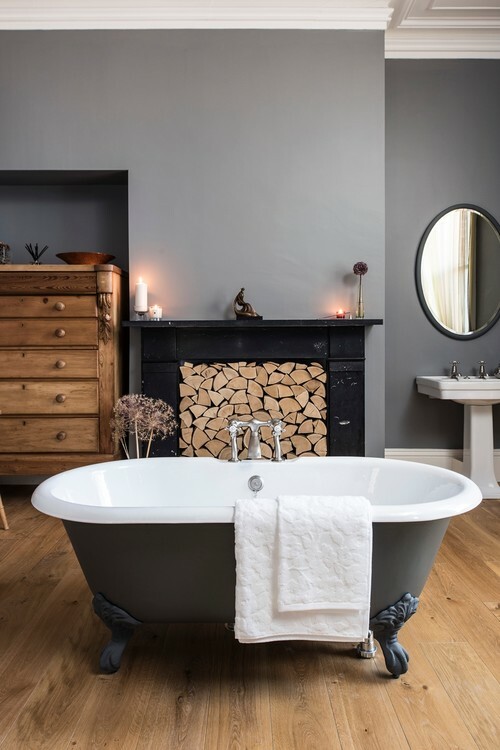 Today I’m sharing a collection of mantels and fireplaces to warm your spirits. 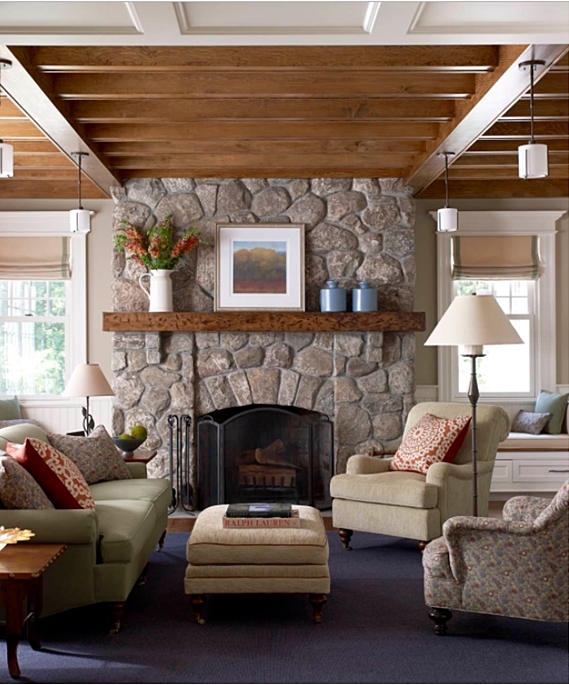 A beautiful stone fireplace creates a beautiful focal point in a country style living room. The simple wood mantel echoes the gorgeous wood beams overhead. This room is the perfect place to light a fire and enjoy a snowy day. 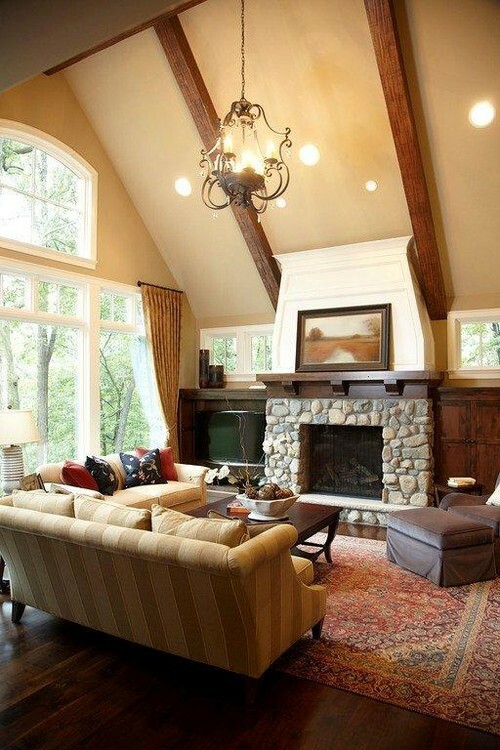 Another stone fireplace warms a traditional style living room with vaulted ceiling. 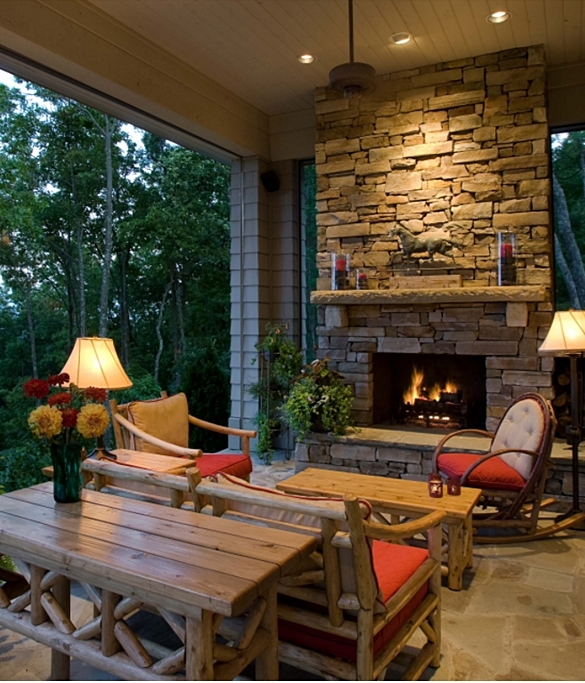 Application of the same stone work on the walls blends well with the fireplace itself. 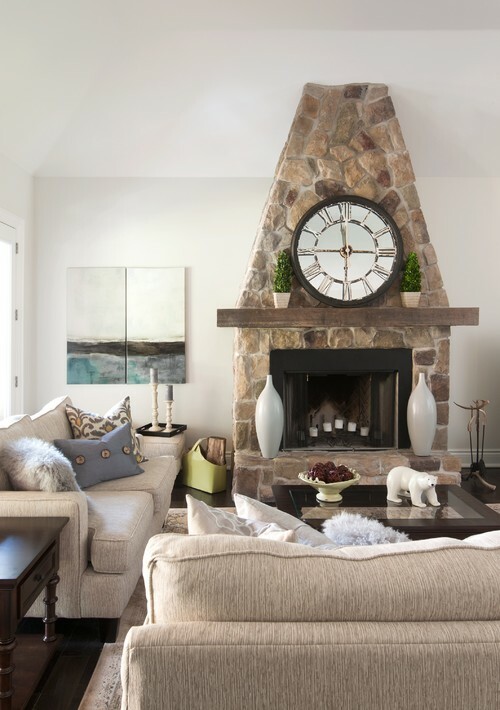 Create a perfect mix of stone and painted wood by using a painted mantel surround on a rustic stone fireplace. 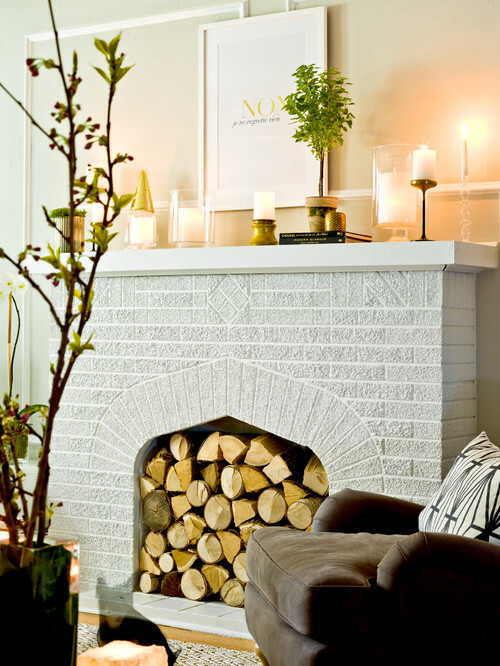 Light gray brick creates an elegant fireplace. This stone fireplace makes an architectural statement with its narrowing size the taller it gets. A mix of stone and painted wood creates a unique fireplace in a European style family room. Mantels and fireplaces look great in a variety of textiles. 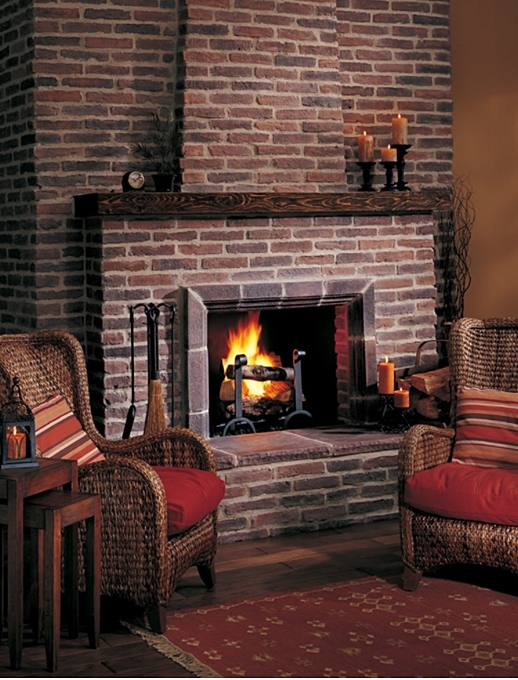 This dark brick fireplace provides texture and warmth. 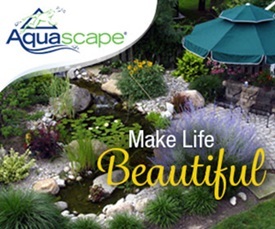 Outdoor fireplaces are wonderful in all seasons of the year! 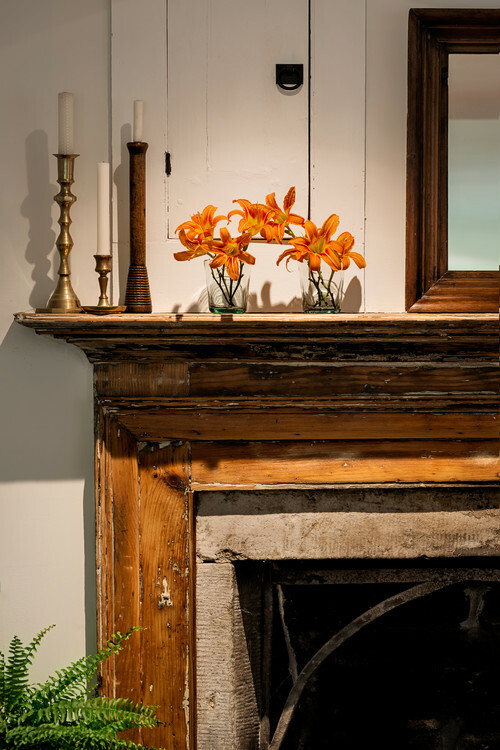 An Early American mantel and fireplace has been stripped of layers of paint to reveal its original gorgeous wood grain. 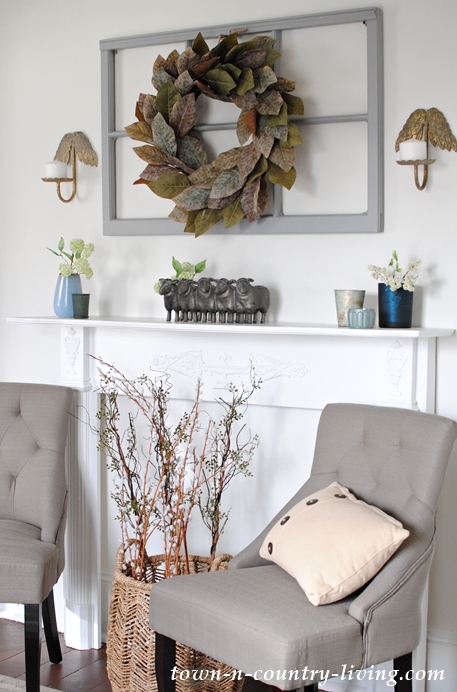 If you don’t have a fireplace but like the look, consider adding a faux mantel to a room. 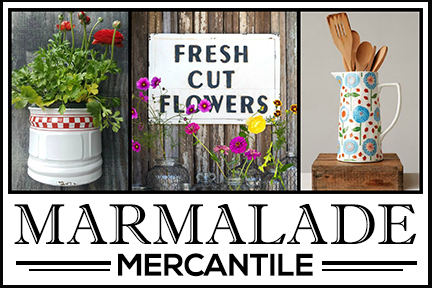 You can find vintage mantels at flea markets, antique stores, and even resale shops. If you find a vintage mantel in poor shape, take it home and paint it. These can often be economical treasures! 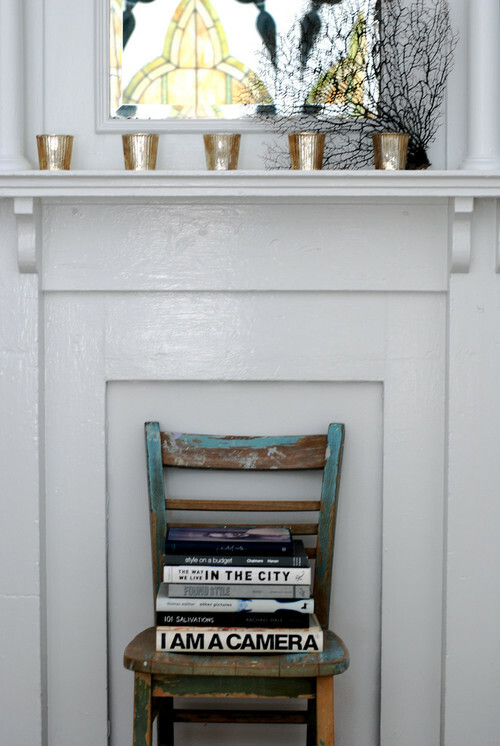 Paint the mantel white, or give it a coat of dark paint for a bit of drama. 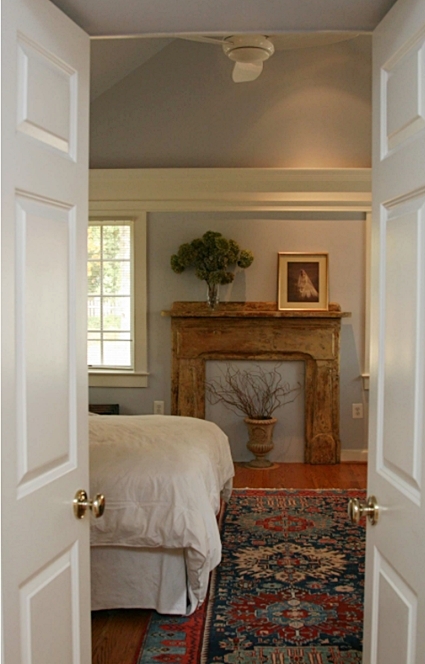 A wood mantel is positioned so that it’s the first thing you see when you walk into this cozy bedroom. I found my vintage mantel a couple of years ago in a local resale shop. I’m thinking about painting it the same gray that you see on the window frame above it. What do you think? Leave it white or paint it gray? 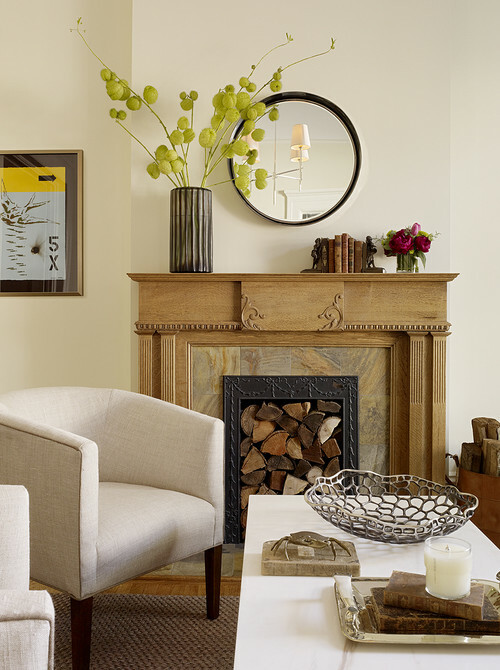 Do you have mantels or fireplaces in your own home? 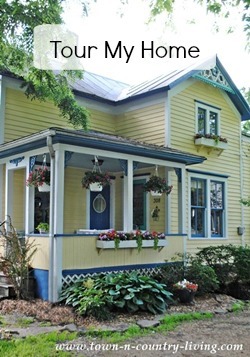 There’s still time to sign up to enter to win a copy of City Farmhouse Style! I think it would look great painted grey, though it is lovely as it is! Yes, we just moved into our new home last Saturday. 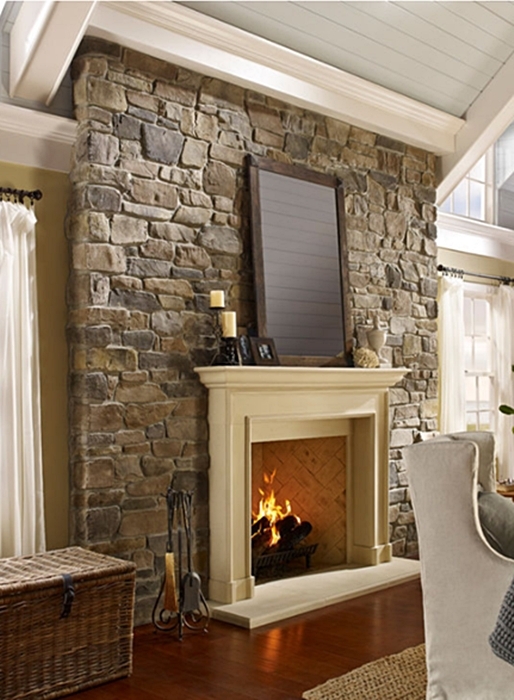 We have a stacked stone fireplace with a stone mantel and hearth. I think it would stand out more painted gray. We do have a non working fireplace with a mantle that I love to decorate. Honestly your mantle will look great painted or as is. 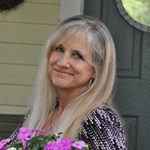 Go with your gut, you haven’t seemed to be wrong yet! Thanks for the post. I loved seeing all the different mantels. I just stayed at a Vermont bed and breakfast that was built in the 1700’s… and they had one of those fireplaces the length of a wall, that was the kitchen stove, whole house heating system, you name it. So beautiful and rustic. I’d paint your mantel black, with a little distressing. I think that would be striking. Right now it seems to blend in with the wall a bit too much.